Jesus Christ was resurrected. He overcame death, sin, sorrow, and all travail man would ever know. The Savior of the world lives. And He wants to help us all overcome. This Easter, let your heart open to the light of the world. Receive the Son of God. I went home teaching the other day. As I was teaching the lesson I felt like I gained a deeper insight into a verse from the bible. In the Church of Jesus Christ of Latter-day Saints each congregation looks out for each other. One of the ways that we do this is through home teaching. 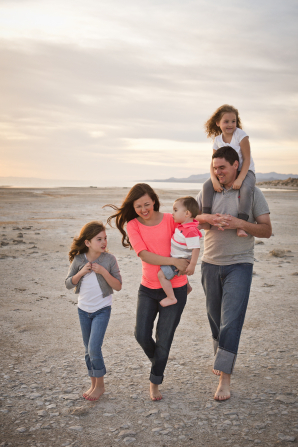 Each person is assigned a family or multiple families that they are in charge of visiting. Typically there is at least a monthly visit with a brief message based on a message from one of our prophets or apostles written for that month. In addition, home teachers look for opportunities to help and serve the family and try to be sensitive to promptings by the spirit of the Lord. I then asked the question: “what stood out to you as I read that verse?” We discussed how we could all include Heavenly Father more in our lives. What a wonderful opportunity we have to seek and receive guidance from the Lord about anything in our lives. It doesn’t matter what the subject is, if we sincerely seek the Lord’s guidance, he will help us. This was a way of life for Christ while he was on the earth. He sought to do the Father’s will constantly and as we do the same, we will become more like Christ. We will be able to feel closer to our Father in Heaven. I know that God lives and answers our prayers. I know that Jesus Christ lived and showed us the perfect example. His atonement provides the opportunity for all of us to return and live with our Father in Heaven again. This week I came across this captivating depiction of the prophet Noah, from the Old Testament, exhorting the people of his time to speedily repent and remember the Lord and His ways. I admit I have seen this picture many times throughout my life, and realized I have usually focused mainly on Noah while overlooking some of the other telling details of the painting. I could not stop looking at the multitude surrounding Noah. I started to feel frustrated and impatient at their behavior. I wanted to shout at them to quiet down and listen up. I wanted to climb up next to Noah and tell him that I would follow and believe. I would act. I was completely annoyed and disgusted at their behavior. And then I paused in this thought process. It only took a few simple questions, and I knew why I was so drawn to the flippant and sin-laden audience. I could relate to their attitudes. I could see at least a degree of casualty toward imperative eternal truths in myself from time to time. A feeling of sorrow slowly nudged at my heart. He is a prophet called of God. He is not just casually standing about telling the people to think about God every once-in-a-while. He is not ashamed of the word and commandments of God. He is not concerned with the weather at the moment, or any opinion contrary to God's will and law. He is standing in the hot sun, arms raised, mouth open, boat under construction as per God's direction, and he is testifying. He is trying and fully desiring to RESCUE. He knows what is to come. He has the message that will literally save the lives of every single person willing to obey. And none will be saved. Their current lifestyle choices prevent them from seeing him as anything other than crazy or lost in illusion. To them he is a fool. Does God still provide and speak to prophets today, and reveal what will keep his children safe and happy in an ever changing world? He does. There were prophets of old, and I can testify that there is a living prophet and apostles called today. They have the words of eternal life, and they can give us all we need to be protected from the floods of confusion, sin, false doctrine, and all manner of evil abroad in the earth. Elder M. Russell Ballard is one such called apostle in the Church of Jesus Christ of Latter-day Saints. He teaches, "It has always been a challenge for the world to accept living prophets and apostles, but it is so essential to do so in order to fully understand the Atonement and teachings of Jesus Christ and to receive a fullness of the blessings of the priesthood that are given to those He has called." "And the flood was forty days upon the earth; and the waters increased, and bare up the ark, and it was lift up above the earth.
. . . and Noah only remained alive, and they that were with him in the ark. And the waters prevailed upon the earth an hundred and fifty days." 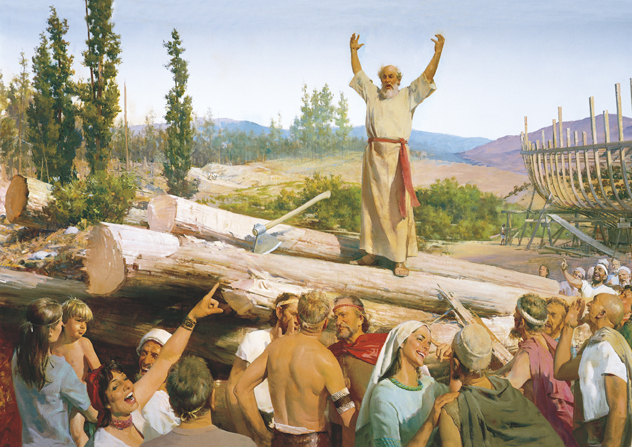 I wonder if any scorning people depicted in this picture had the exhortations and warning words of the prophet Noah on their minds as water confiscated their last breath and filled their lungs.Through the prophets' words the Savior was reaching out to the people with arms open ready to save. The prophets' counsel is always motivated by love. It is directly from Heaven. I can testify that it is no different today. The living prophet on the earth today is Thomas S. Monson, and on more than one occasion I have been saved from tragic spiritual floods that would have left me for dead spiritually and maybe even physically if I had not heeded his counsel. Prophets are called of God to protect and direct God's children while in mortality. Calling a living prophet is one way God shows his love. He has not left us to navigate life alone. He sends direct revelation from Heaven. Jesus Christ stands at the head of the Church of Jesus Christ of Latter-day Saints, and he reveals His will to the living prophet and apostles. I invite you to listen to General Conference found on the Church's website. 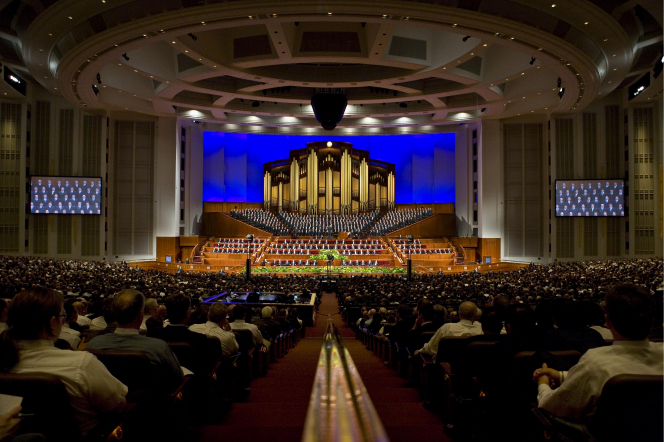 Each year in April and October the church gathers to hear what the prophet, apostles, and men and women called of God desire to teach us about the will of the Savior in these latter-days.